SMALL KUCING: Oh Nasi Lemak ! Oh Termites! Wokay wokay....This is the last "basi"(stale) post....errr.....till next year la....wanna clear off all the basi posts before new year come leh. What's the story about Nasi Lemak? Nothing much la....Just that Mamarazzi lazy to cook lo so pakai hentam again. Just put the rice into rice cooker and put some santan, salt , pandan leaves and eggs into the rice cooker to make Nasi Lemak lor. Eggs in rice cooker you said? Yup....coz lazy bum mah...lazy to make hardboiled eggs separately so just put into the rice cooker and boil together lor. The sambal was easy to make coz each time we tapau Nasi Lemak, she would ask for the sambal to be packed separately. The extra sambal, she would put into the freezer. At time like this she just need to defrost the sambal, reheat and add in some "sotong"(Squid) & sliced onions. Done. Fried some chicken gizzard for Papa and fried eggs for herself . Yup...she doesn't like hard boiled eggs. Me? I get to do the "food presentation". Looks like Cookies Monster from the Sesame Street or not? On a non-related matter, we went to Gardenia bread factory during our school trip and was given so many goodies . Not bad ya. Too bad no pic of me coz our group was split up. My group did not have a photographer. Nevertheless I had great time there. So much fun leh. The "gardenia Chef" made me laugh so much. After that we went to Tenmoku Pottery ...we played with clay and subsequently we were allowed to bring home our "creation"
Another "basi" news was that part of our car porch roof collapsed a few months ago. It happened on a super rainy and windy day. Lucky we were not home then or else sure the car kena "penyet"
From the traces of wood, there were sign of it's being "eaten". 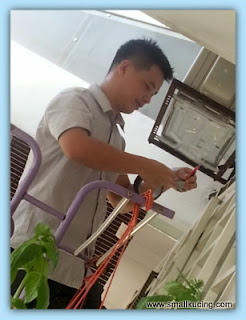 Ah Kong said must termites. Complained to the developer and they sent their men come and check. True enough.....found part of the car porch roof having this. At that time we didn't know. 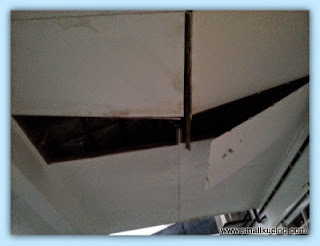 Just took insect spray and sprayed the roof and the men said will come repair next day. But Mamarazzi was worried about termites spreading into the house. 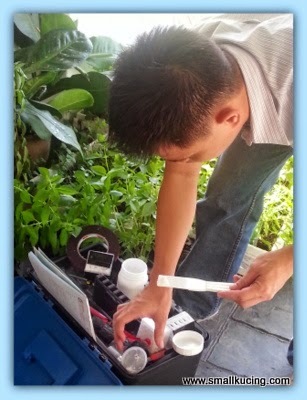 Thanks to Auntie Siew, we got the contact of the Pest Control Company. Very efficient leh. Night time called him and next day the man, Jack, came already. He checked the whole house. Thank goodness only the car porch kena. Said next time if have termites, MUST NOT spray and do not disturb . 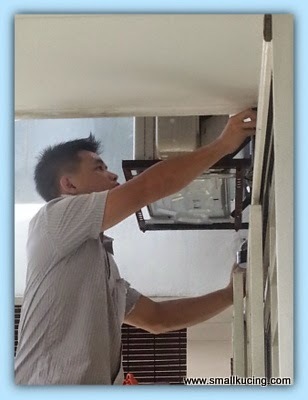 Coz spraying will also "chase" the termites from one part of the house to another part. Better to call in the professional put baits . The termites eat the bait and die in the colony and one eat another and die.....and so on. Not sure whether it is common practice for this industry but Jack immediately set work to put the termites bait. Tarak mintak(didn't ask) payment first before start work wor. We only paid in a day or two later. He said they will come and check every two weeks . True enough. Mamarazzi did not need to call him. A day or two before the due date he will whatapps Mamarazzi to make appointment. Glad to say that currently we are termites free now but the company will continue to come and check the house periodically. oooh.... I love nasi lemak too and had it every Sat or Sun. Oh... I hate termites...they are troublesome and yes, need to spray those chemicals on them. I don't like that smell. glad the termites were not too far spread! I thought this is new house, also got termites ah? Termites really ganas loh. Lucky only the car porch kena. Did any of the termites eat the bait? Small kucing is really creative. The plate of nasi lemak really looks like cookie monster. Mamarazzi is really clever to save all the sambal in the freezer and then when she cooks nasi lemak, very fast can get sambal, just need to add in more things to it. Nasi lemak and termites? 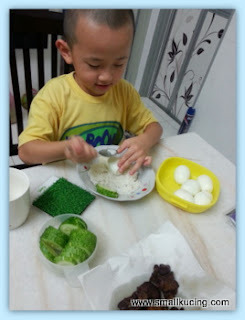 Sounds funny.. hehe.. Mamarazzi very clever already la, know how to make nasi lemak.. 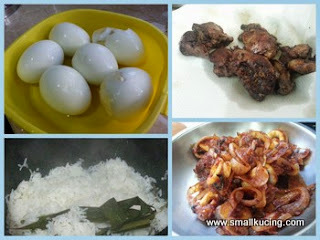 I've never cooked nasi lemak in my life b4.. Only know how to eat, hehe.. Whattttttt???? You just moved in and already got termites? Walao eh!!! How can! Sue the contractor! Hmmmm...handsome pest control guy, dressed up so neatly some more. LOL!!! I love nasi lemak but I am super lazy to prepare and cook it. Hehe. Easy to eat outside. Yaloh. Better call the professional to come next time when it comes to termite. Termite is a home's worst enemy. Oh no termites.... must get rid of them. 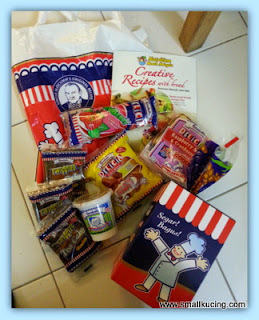 Hope everything will be ok.
eh, so nice, Small Kucing went to Gardenia's factory and given so many types of bread and cake and kaya too!! eih, like thst berbaloi lah but too bad no photographs taken leh.. Uncle SK thought Small Kucing has his personal camera, not allowed to bring into the factory kot?? Thumbs up for the Elmo! That's a lot of eggs though, each one eat 2 issit? Eee the termites so geli. Termites are a nightmare! Sometimes you think you got them all, but one or two might escape and kickstart the problem all over again. Really need professionals to check and recheck..
Hmm... should slip in an egg next time my mother cooking rice to see if boleh pakai or not. I suppose it's no problem if you want hard boiled, but not for half or partially-cooked eggs..
Wah, really banyak curi steps punya nasi lemak! Luckily the termites haven't come into the house. Lucky discover the termites in time. The homecooked nasi lemak looks good leh. Thats a clever invention of a nasi lemak meal. I also sometimes pakai hantam.The trip to the bread factory must have been knowledgeable to your little and the terminate thing - no guarantee won't be attacked again, sometime other areas which we don't notice. So keep an eye! 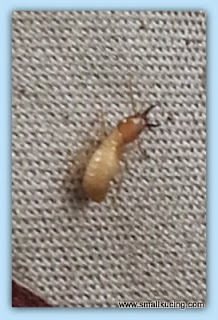 Hi, Termites are NO fun... Glad your pest company fixed you problem... We have a contract and get sprayed here every 2-3 months... So far, no problems for us (and our WOOD house)...Glad your problem was only in the garage area. Looks like the Little One (who is growing up much too fast) had a good time at Gardenia Bread Factory.... Neat that they got lots of freebies from that little trip. Mamarazzi always adventurous in cooking. Have your tried the very popular tomato rice ? I am thinking of cooking that one of these days. I so envy Mamarazzi. So terer cooking Malaysian dishes. 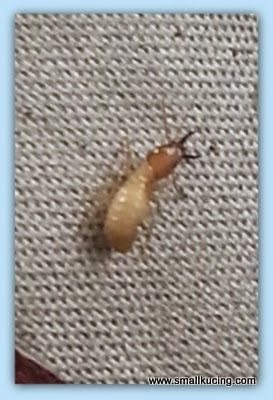 Eee, the termite looks gerli! They are so scary ho? So envy with Mamarazi. 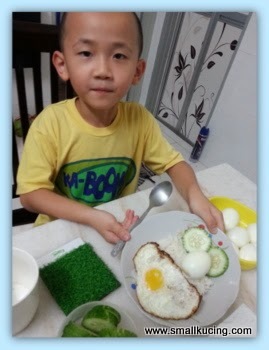 Really talented in cooking Malaysian dish. 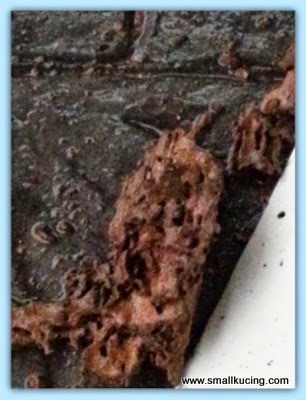 Eeew..termites..Luckily they have solved your problem very fast. Very efficient. ya ...it took few weeks but managed to handle it. Termites!!! Those things are horribe and so destructive.